Malaysia's ex-PM Najib rails at police, wife warns of "public trial"
Malaysia’s scandal-hit former leader Najib Razak and his wife hit out at the media and police on Saturday, after investigators seeking evidence of corruption were filmed seizing box loads of jewelry, luxury handbags and cash. Following a surprise victory in an election on May 9, the new government led by Mahathir Mohamad has opened investigations into how billions of dollars disappeared from 1Malaysia Development Berhad (1MDB), a state fund founded by Najib. Najib, who has consistently denied any wrongdoing, and his wife, Rosmah Mansor, have been barred from leaving the country. 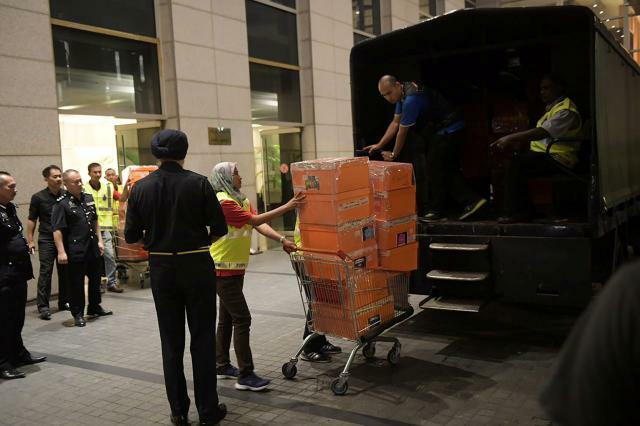 Items seized by police from Najib’s residence and other locations linked to the couple included 284 boxes of designer handbags, including prized Birkin handbags from Hermes. Dozens of the luxury bags were filled with cash and jewelry. “No attempt was made to verify whether these dresses, shoes, babies clothes and all had anything to do with the investigations which are ongoing,” he said. Television and press reports of police carting away the former first family’s personal belongings raised objections from Najib’s wife. “It is our hope that the authorities would observe the rule of law and due process, to avoid a premature public trial,” Rosmah’s lawyers, Valen, Oh and Partners, said in a statement on her behalf. “Enforcement agencies should not be feeding social media trolls, but observe and uphold strict professionalism at all times,” it added. At least six countries, including the United States, are investigating the multi-billion dollar scandal. The round-the-clock search at their residence have prompted some public criticism, including Najib’s political rivals who are now in government. “As former victims of early dawn police raids, I must stress my disagreement in ransacking any home at such an ungodly hour,” said ruling coalition politician Nurul Izzah, the daughter of Anwar Ibrahim— a reformist who was recently released from jail on Wednesday and given full pardon. “Charge, investigate, prudently,” Nurul said on Twitter.